In 2006 Wine.Woot was launched; a site that offered wine and wine related products once per week. Today, Wine Woot offers deals every day! Of course due to US wine shipping laws, delivery is only available to a limited number of states. Since the deals are being offered on Woot by different wineries, the list of states that the wines can be ship to vary. For more information, see Wine.Woot for details regarding each deal. Wine.woot.com currently ranks #12 amongst sites offering online deals -- DX Offers ranks #11. In the Food and Wine category, Wine.Woot ranks at #1. 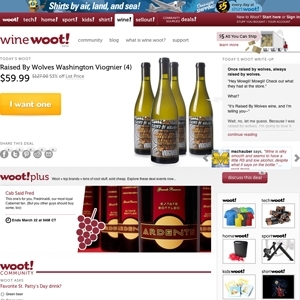 Wine.Woot is considered the most popular deal a day site, ranking in at #1. As for the 2nd most popular site, it's Giveaway of the Day. Offers daily deals on wines.